Toast Topper #10 - Pineapple Ground Cherry Jam | What Smells So Good? Can you believe it's almost the end of September? It seems like only yesterday that I was waxing poetic about the deliciousness of still-warm tomatoes and whining about the fact that our air conditioner had gone bust (though that was only the beginning of the month). But there you have it - this morning I had to rescue the last of the tomatoes on the vines because last night we had a touch of frost. Yes, frost! The end of September also means the beginning of the major holiday season. October is a whole mess of events around here - between my grandmother and stepbrothers' birthdays (as well as the birthdays of two of my best friends from highschool! ), Thanksgiving and Halloween it feels like every week there's something! Come November, it's fairly quiet, but that will be the major month of Christmas planning, shopping and (in some cases) wrapping. I'm starting to put together my "gifts to give" list already, which is packed with home made goodies from jars of jelly, tomato paste and pasta sauce to cookies, tarts and muffins! I've even got a few "mix-in-a-jar" treats in store, and have begun to scope out our discount grocery stores for boxes big enough to jazz up and turn into "gift baskets". 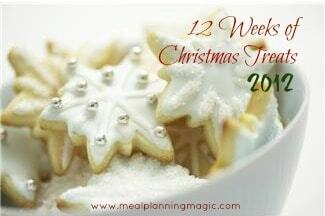 This year I'm also taking part in a weekly round up of Christmas / holiday treats on Meal Planning Magic. We're invited to make and post a treat each Thursday from today through to Christmas, all with a sweet edge! You can hit up the group on Twitter (#12WksXmasTreats) and gape at the gorgeous photos on Pinterest too. The first week I'm bringing something sweet, tangy and tropical from my backyard - Pineapple Ground Cherry Jam! I really wanted to capitalize on the tropical flavour that my pineapple ground cherries had (even at the end of the growing season), so I combined them with pineapple tidbits (which always remind me of holiday ham), pineapple sage (which I grew last year and dried), agave nectar and a hint of ginger. I canned it (save for a few "taster" tablespoons!) and am going to give it out with homemade crackers. As is, the jam is perfect on your favourite toast or crispbread, but you can make it into jam tartlets or thumbprint cookies for an even sweeter edge! I'd suggest a coconutty thumbprint cookie or adding a few tablespoons of coconut flour to your tartlet dough, if you're going that route! In a large pot, combine the ground cherries, pineapple (with juice), ginger, pineapple sage and agave and bring to a boil. Cook 20 minutes, stirring often. Add the sugar (and pectin if using) and bring back to a boil, then boil 5 minutes, stirring constantly. Pour into a sterilized jar, seal and process in a water bath for 10 minutes. What an interesting idea!! I've never heard of such a jam, but it sounds delicious! Very pretty jam and looks like it would be delicious spooned over a block of cream cheese with crackers on the side. This sounds like a really neat combination of flaovrs and I also love that you're thinking ahead to gift giving for the holidays and using what's available to you locally. Glad you're part of the hop this year! This certainly is a different jam to make and to give. It sounds wonderful! What a cool idea and it looks gorgeous!